High-performance, low-footprint, 1U rack server supports compute-intensive and cloud applications, saves energy, lowers TCO, and simplifies management and maintenance. Standard 1U, 2-socket rack server supports Intel® Xeon® E5-2600 v2 series processors with up to 20 cores, achieving high performance for compute-intensive applications. Maximum 16 TB internal storage capacity strikes an optimal balance between performance and density. 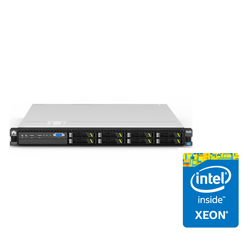 Huawei server with Intel® Xeon® processor. Intel, the Intel logo, Xeon, and Xeon Inside are trademarks or registered trademarks of Intel Corporation in the U.S. and/or other countries. High density: Two RH1288A V2 servers can be deployed in a 2U space, doubling the computing density of a conventional 2U rack server and saving up to 50% on space. 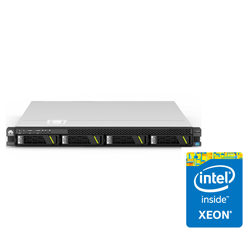 Outstanding computing performance: Employs one or two Intel® Xeon® E5-2600 v2 series processors with up to 10 cores per processor. Flexible local network configuration: Supports two GE ports without occupying any PCIe slots, improving network availability. Energy efficiency: Efficient 80 Plus® Platinum PSUs comply with Energy Star standards and have passed the China Energy Conservation and Environmentally Friendly Certification; dynamic energy-saving and power-capping technologies limit server power consumption to a preset threshold, improving overall energy efficiency.